Deputy Prime Minister and Minister of Foreign Affairs H E Sheikh Mohamed bin Abdulrahman Al Thani has announced that the State of Qatar intends to host this year a high-level regional meeting to address the brutal crimes committed by the ISIS group, in cooperation with the Special Advisor and Head of the International Investigation Team to promote accountability for crimes committed by ISIS group in Iraq. In a speech at a meeting for the ministers of the Global Coalition to Defeat ISIS in Washington, yesterday, H E the Deputy Prime Minister and Minister of Foreign Affairs said that the State of Qatar will spare no effort in supporting the brotherly Iraqi people at this stage, underscoring Iraq’s ability to overcome the challenges facing the reconstruction process, while calling on the international community to support Iraq in its reconstruction efforts. He stressed that the fight against terrorism is a high priority for the State of Qatar, pointing out that Qatar has participated actively in all the activities of the Global Coalition and will continue its efforts at the national, regional and international levels. The Deputy Prime Minister and Minister of Foreign Affairs said terrorism remains one of the most serious threats to international peace and security at present, adding that the success of the Global Coalition in defeating the group in Iraq and Syria reflects the international will to eradicate terrorism. The Deputy Prime Minister and Minister of Foreign Affairs stressed that the success in combating ISIS group and eradicating its ideology can be sustained only by addressing the root causes of terrorism and extremism, ending and preventing armed conflicts, uniting efforts, promoting regional and international cooperation and abiding by the relevant provisions of international law. Meanwhile, the Deputy Prime Minister stressed Qatar’s firm position that calls for resolving the Syrian crisis in accordance with the Geneva resolutions and relevant Security Council resolutions and holding war criminals accountable for crimes committed by terrorist groups or those who practised State terrorism. He noted that the phenomenon of foreign terrorist fighters is a very important issue and should be addressed through comprehensive approach and these fighters should be rehabilitated and integrated into their societies within the framework of criminal justice. 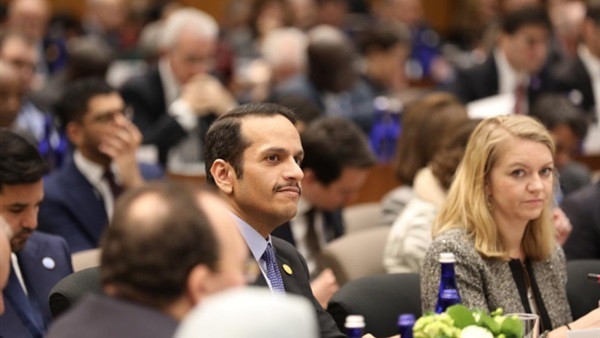 Last October, he said, Doha hosted a high-level conference of regional and international experts to discuss ways to address the phenomenon of foreign terrorist fighters, adding that the conference came out with important recommendations in this regard.